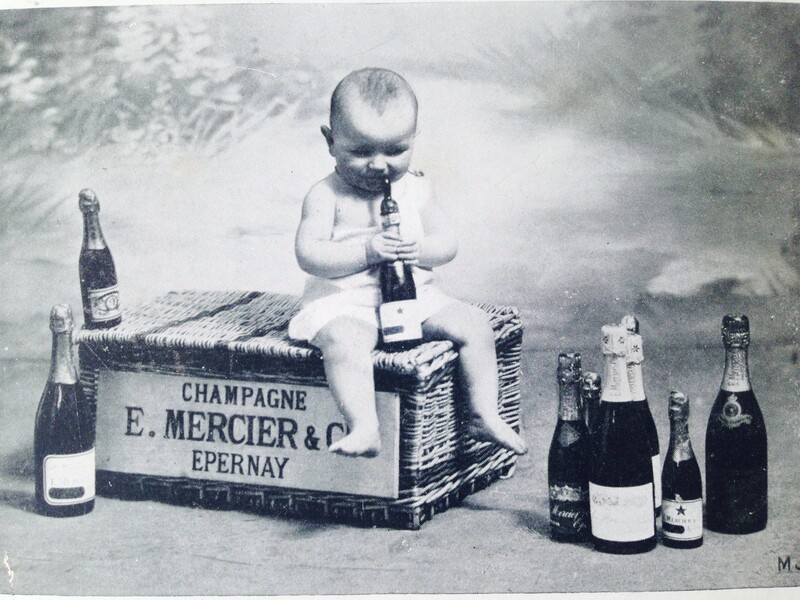 A vintage French postcard depicting Baby New Year disgorging a bottle of Champagne with his gums – obviously his mère forgot the saber. I’ve had the great pleasure of visiting Champagne, France this year and witnessing the Champagne growing, making and marketing practices first hand. I admire the history, heritage and innovation of Champagne as well as the vigilance the French have instituted to protect the appellation. Champagne is my passion and I adore it like no other libation (a masterful rye Manhattan with Luxardo Maraschino cherry comes in a respectable second place.) Alas alack, my Champagne taste have led me to a sparkling wine budget. I can only run from the law and my debtors for so long; I’m tired and thirsty. In an effort to reform my ways, I have compiled this list of stunning sparklers that won’t lead you astray in the coming year. Of course, if you happen to succumb to a bottle of Cristal or a vintage Pol Roger rosé, there is no reason to despair, unless your credit card is rejected at the register. 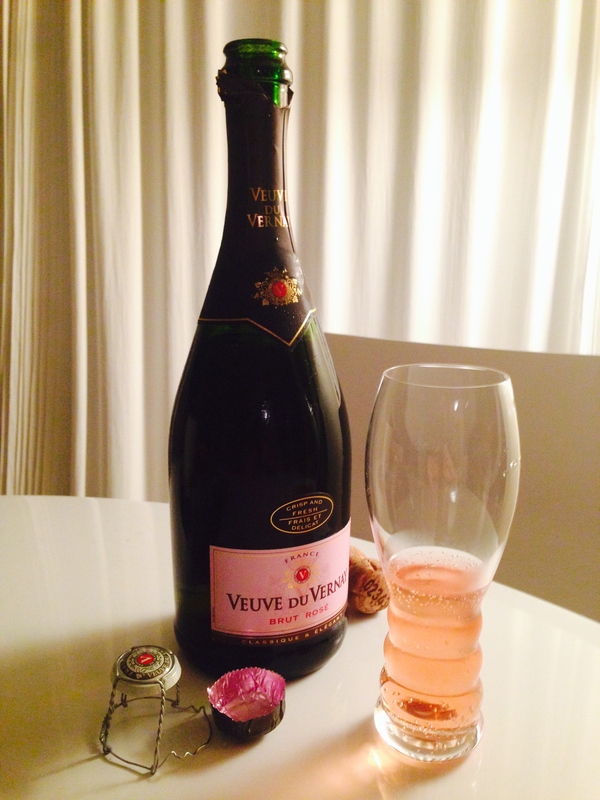 Rating: Caseworthy – the best Cava I have ever tasted. Why Buy: For the value, this is a delightful wine and expresses itself as well if not better than wine twice the money. Guests love this wine and comment on it’s lovely fruit essence and crisp, clean dry finish. This traditional blend of Xarel-lo, Parellada and Macabeo varietals comes from the region of Penedès, and the cellars are located in Vilafranca del Penedes about 20 Km from Sant Sadurni the capital of the region. Run by three generations of wine makers, the vineyard is in the process of becoming 100% Organic and consists of 75 hectares of trellised vines 1000 feet above the Mediterranean Sea. Notes: This wine is very effervescent with a lovely nose of apple and grapefruit. The first sip reflects the nose accordingly with fruit, citrus and a pleasant pastry yeast. The reason this wine is so special is the dry, clean finish that is surprisingly light, no bitter aftertaste like other Cavas and for this low, low, low price point, this wine is an amazing find! Where To Buy: Total Wine, Oliver’s Market, K&L Wine Merchants and many other locations nationwide. Rating: Guestworthy – the perfect apertivo! Why Buy: Founded in 1860, by Cleto Chiarli, it is the oldest wine company in the Modena region in Emilia-Romagna. The great grandson, Anselmo, represents the fourth generation of wine makers who continue to produce this delicate style of Lambrusco sparkling wine in a region best known for balsamic vinegar. The wine is composed of 85% Lambrusco Grasparossa di Castelvetro 15% Pinot Nero. If you come across a bottle I hope you enjoy it as much as I did with my father. 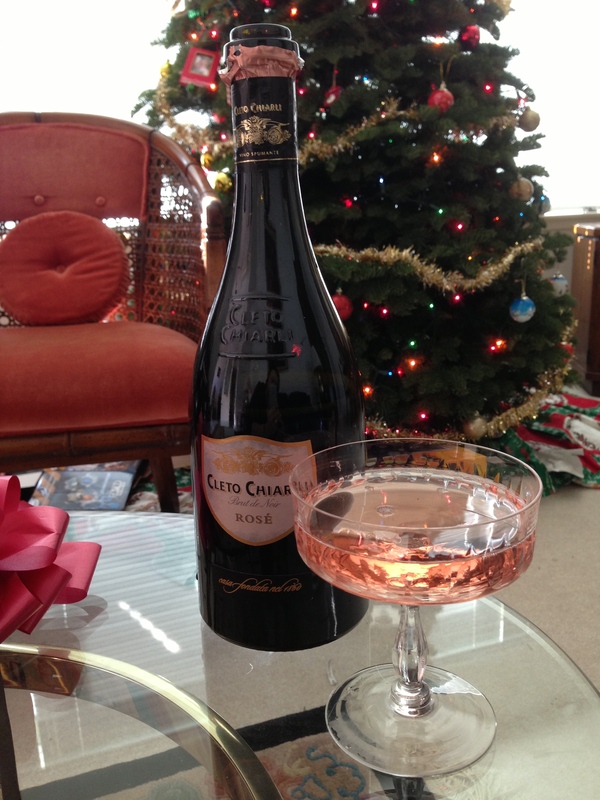 We popped the bottle on Christmas day and sipped it from mom’s fine crystal. Notes: Nose was floral, strawberry, bubbles lively, very effervescent and the first sip had a delightful fruity, yeast commencing with a dry finish that lingered nicely with a toasted almond essence. Where To Buy: Ferry Plaza Wine Merchant in SF and hopefully everywhere else, but if not, plead your merchant to stock it maintenant! Rating: Caseworthy – in case of emergency pop cork! Why Buy: I would have this wine on hand for any occasion, big, small or disastrous. It comforted me through a wicked storm and if forced to remain indoors due to inclement weather, a case of this will entertain you for hours. Easy to drink, soft and accommodating to all kinds of guests and foods. Antonio Franco founded the “Cantine Franco” winery in Valdobbiadene in 1919. Valdobbiadene is located at the foot of the Prealps, in the Venetian region, and is famous for Prosecco. This winery is one of the oldest in Valdobbiadene, located in the town centre, not far from the vineyards. Antonio Franco founded it, Nino Franco expanded it and Primo Franco optimized the process throughout the years. Primo took the reigns in 1982 which was the turning point for the Nino Franco brand as he successfully began to export the wines throughout Europe, the Americas and Asia. Notes: The nose was very light if almost non existent, but the first sip was incredibly pleasing. Classic stone fruit, peach, some pear with a light floral aroma. This dry Prosecco finished very clean and although it was very soft, not very complex, there was enough body to keep it interesting. Where To Buy: Total Wine, Oliver’s Market and many other locations nationwide. Rating: Buy Again – great presentation and perfect served very chilled. Why Buy: This French sparkling wine from the Loire Valley is a blend of Cinsaut, Grenache and Syrah. This brand was created by Mr.Jean Eugène Charmat, the French scientist, who in 1907 invented the cuve close (“sealed vats”) method of producing fine sparkling wine which has since been adopted worldwide. Most sparkling wines are produced in one of two ways: Method Traditionelle wherein secondary fermentation happens in bottle, or vat fermentation which is eponymously named the Charmat method. Notes: Color is a gorgeous salmon pink. The nose was fruity, candy apple. First sip I tasted strawberries, florals and it had a nice balanced acid and flavorful intensity. Even though it was fruit forward, it was not sweet and the finish was long and dry. Mousse was moderate but still rich. As the wine warmed, the flavors nicely became more intense but I also noticed a nutty bitterness that leaves me to recommend serving this very chilled to experience this wine at its best. Why Buy: This is quite possibly the least expensive good Champagne available in the US. It’s a brut that is light dry and very smooth. 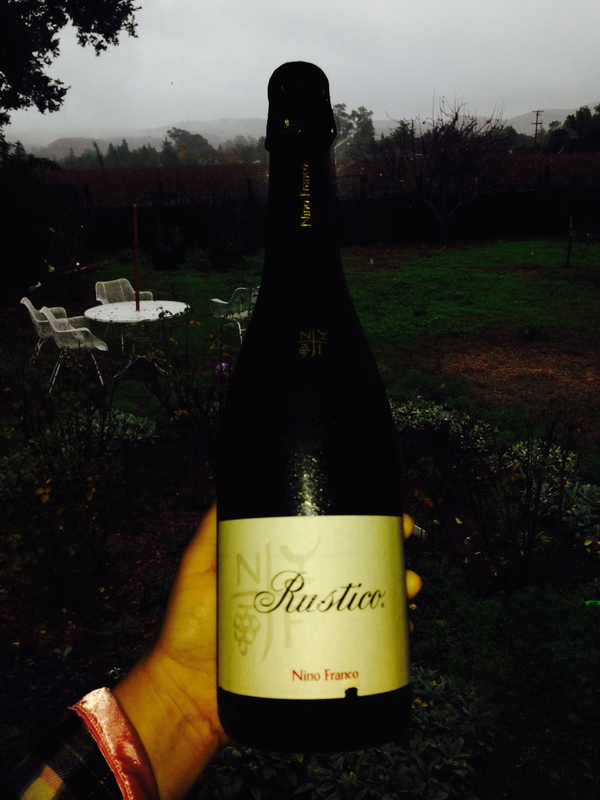 It is a classic blend of Pinot Noir and Pinot Meunier. I love this wine because it epitomizes the French methode traditionelle beautifully at the right price and with a delight that makes any occasion special. It holds up to Champagnes two or three times the price and sometimes there are no substitutes for the real thing. Notes: The classic French Champagne profile is reflected in the nose of fruit, florals and brioche. The fist sip is crisp with notes of apricot, stone fruits and a good balance of acid and yeast. The wine finishes dry with a delicate nuttiness and minerality evident of a pleasant level of cave aged yeast. Happy New Years to all of you – here’s to more great wine finds in 2015! Lovely! Will investigate these selections immediately . . . Happy New Year!! Great job as always–good to know you only need a few hours to polish off a case (yeah, I read a little bit into your words there)! Happy New Year! Nice list. Will have to head to my local Total Wine and stock up. Happy New Year! Cheers. I love that place – can’t wait until they take over the world – still pining away for one up yonder here in the SF Bay Area. Happy New Year Michelle! Happy New Year to you too Loie! I know it is far but I am going to be in Ventura County in a couple of weeks, if you want to come down and visit some wineries on the Ventura Wine Trail with me please let me know! You never know! Keep me posted on dates – if I’m headed South on business, I could take a quick detour 😘xo regardless, ALWAYS appreciate the invite!